For the first time, a company responsible for climate change faces legal charges in Europe. For the first time, a person affected by the hazards of climate change is suing a company in Europe: this morning, Saúl Luciano Lliuya has filed a lawsuit against the energy company RWE at the Regional Court in Essen (Germany) with his lawyer, Dr. Roda Verheyen (Law Firm Günther, Hamburg). Saul Luciano fears for his home city of Huaraz which is threatened by a possible flood wave. The lawsuit argues that the Essen-based company is partly responsible for glacial melting in the Andes and thus also for the danger to his house which lies at the foot of the mountains. It requests that RWE contribute financially to safety measures at the lake above the city, which has grown immensely as a result of glacial melting. The payment requested is proportional to the company’s contribution to climate change. “Every day I see the glaciers melting and the lakes in the mountains growing”, says Saúl Luciano Lliuya, who works as small-scale farmer and mountain guide. “For us in the valley the threat is extreme. We can’t just wait and see what will happen. It is clear to me that those causing global climate change also have to take on responsibility. 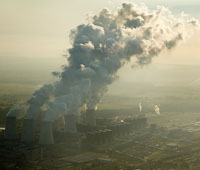 These are international companies which change the climate by emitting greenhouse gases into the atmosphere.” At Saúl Luciano’s request, the German environmental and development organisation Germanwatch is consulting him in this matter. RWE describes itself as the top single-greatest CO2-emitter in Europe. According to a 2014 study, the company is responsible for half a per cent of the total emissions that were released into the atmosphere since the beginning of industrialisation. Even if RWE is only one of those responsible among many, Saúl Luciano Lliuya demands that the company pay its fair share for implementing necessary safety measures in Huaraz. The case is about roughly 20,000 Euros – an important first step. Luciano Llliuya’s lawyer Dr. Roda Verheyen explains: “This is a precedent. RWE AG releases significant emissions, principally through its coal-fired power plants, which makes global temperatures rise, causes glaciers to melt and leads to an acute threat to my client’s property. We request that the court declare RWE liable to remove this impairment.” In late April of this year, RWE rejected letter of claim on this matter. The lawsuit is the next step. The Intergovernmental Panel on Climate Change (IPCC) links Andean glacial melting back to global climate change. In Huaraz, the danger is imminent: the glacial lake Palcacocha, which lies several kilometres above the city, has grown four times in size since 2003. Climate change has also increased the risk that large pieces of ice will break off the glaciers and fall into the lake. This could cause a massive wave, leading to a devastating flood in the densely settled areas below. The Peruvian disaster protection agency warns that there could be a flood at any moment; the Palcacocha glacial lake is the most dangerous in the region. In order to sustainably decrease the risk, large amounts of water need to be pumped out. This requires a new drainage system and reinforcement or amplification of the lake’s dams. “We support Saúl Luciano Lliuya’s claim“, says Klaus Milke, Chairman of the Board of Germanwatch. “Only a few days before the Paris Climate Summit, this lawsuit against RWE sends an important message to the energy sector and to policy-makers: emissions must drop to prevent more people from being threatened by climate change. And those responsible for the risks must take on the costs to protect the people who are affected.” Germanwatch does not consider it a permanent solution that these people – who are often very poor – need to take the matter to the courts. “Ultimately, there needs to be a political solution to hold accountable those who are responsible,” says Milke.